Knowing when to use grub control on your lawn makes all the difference. Fall is the most important season for treatments because this is when grubs do the most damage to lawns. It’s imperative to catch them before they dig in for winter – literally. As temperatures drop, these fat, juicy larvae travel six to 12 inches underground, where they feast on your lawn’s root system all winter. Determine whether you need grub control before deciding when to use grub control. All lawns have grubs to some degree, and it’s not always destructive. Bugs will lay eggs in your yard. They’ll hatch and the larvae will feast on your grass. This won’t have a major impact on your lawn’s health unless there are more than five grubs per square foot of grass. 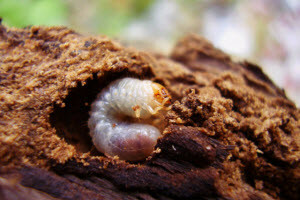 You can find them by digging into the top soil and looking for fat, white caterpillar-like creatures. Consider the role of fertilizer, aeration and nematodes in grub control. Grubs can be minimized in all kinds of ways. Spike shoes hyped for easy lawn aeration aren’t helpful in improving air flow, but they do a great job of ridding your yard of creepy crawlies. Water your lawn, and then walk across it three or four times to do the most good. Fertilizer is also helpful because it leads to thick grass. Grubs and beetles prefer thin lawns with plenty of space to spread blades of grass out. Finally, organisms called nematodes are harmless to humans and to vegetation, but they’ll feast on grubs and clear them out of your yard. You can order them easily online or through your local garden center. After deciding when to use grub control, purchase the best pesticide applications. One of the benefits of working with a professional lawn care company is having access to potent solutions capable of curing pest and weed problems in a very short time. Consumers don’t have the necessary tools and training to handle these safely. You can often save time and money by hiring grub control out. For homeowners who want to do it themselves, products containing trichlorfon, also called Dylox, or carbaryl have proved to be the most effective. Identify when to use grub control during the fall. 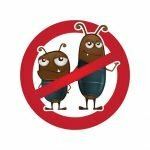 Fall is undoubtedly the best time of year for grub control, though you can address this issue at any point in the growing season. But when to use grub control during the day is a question you should ask. Time of day is important with many grubs coming to the service of the soil during later hours. When using consumer products, opt for treating your lawn between afternoon and nightfall, and water-in the solution to allow it to soak into the soil. Call in professionals when they’re needed. Homeowners living on land with a high sand content face special challenges when it comes to grub control. Pesticides can seep through sand and contaminate underground water supplies so hiring a professional in these situations is always recommended. We’re capable of helping you with whatever lawn care concerns you may have. 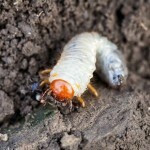 Contact Think Green Lawn Care, and ask when to use grub control on your lawn. Visit online or call (678) 648-2556 to get expert advice today.